in this new section we will introduce exclusive interviews with famous EDM personalities: DJs, producers, promoters, event organizers, radio and club owners, etc. >> Your first band was called Headless Chickens including Thom Yorke. What did you end up learning from him that you used in your work? I really enjoyed working with Thom at the time. I was a decent enough singer but couldn't play guitar or bass, but somehow ended up playing bass and some synths / keys as well as sharing vocals with him on most of the tracks. In retrospect, maybe I should have pressed my case to join him when he left Exeter to do the Radiohead thing :) Was great writing songs in that band though - proper jam sessions, and a kind of telepathic understanding which is something I kind of miss in electronic music, which is so much more studied. >> How did you move from a band to becoming a deejay, label owner and all around famous guy? It was a gradual transition. Flicker Noise was my next project followed by Lunatic Calm, but both of them featured electronics and sequencing at the core of the music, and the band stuff smeared around the edges to lesser or greater extent. I loved the challenge of merging that organic and live / musical looseness with the more regimented and controlled electronics - taught me a lot about production and big broad brushstrokes that I probably would never have picked up on otherwise. Elite Force started around the same time as Lunatic Calm really, which was 1996, around the time it became a LOT quicker and easier to make electronic music & as much as anything I started doing that stuff to have material to play in my sets ... same thing goes for Fused & Bruised, the label I set up around the same time. >> What the hell happened to breaks and were you responsible for its demise? Fashions change, they come & go. People get far too obsessed with narrow-minded definitions of people's creative output. I've always seen myself as an arch eclecticism - I can help myself. I'm just a fan of music and don't ascribe to that simplistic notion of ONE TRIBE. I play across the board and always have. >> So Elite Force was the breakbeat artist, how did you move into the tech-funk arena from there. Was it a normal progression? No man, Elite Force was always a mixed bag - the back catalogue shows that, although it has always gravitated towards breaks on the production side if not in the DJ sets. Tech-Funk isn't really a term that I'd use these days - for a while it seemed like a way of pointing out to people that the music was eclectic and made up from a number of different musical strands, especially in the DJ sets. It's never really applied to a sound. >> Whatever happened to your weekly or was it monthly radio show called \"Strongarm Sessions\"? I did the Strongarm Sessions for about 8 years I think. It ranged from being weekly, to bi-weekly and eventually to monthly. For the last 3 years or so of doing it because I lived in the country without broadband I was doing a 160 mile round trip to record each show ... and then spending half a day in an internet cafe uploading the archives. At the end of the day I got bored of doing that. It also co-incided with a time when bulletin boards were the lifeblood of communication on the internet - when they died back and the feedback lessened, I chose to spend my time more constructively. >> So what is going on with your label U&A? Any releases we can look forward to? Any artists that are coming in the pipeline? It's been a good year for U&A with the likes of The Loops of Fury, Peo de Pitte, Zodiac Cartel and Savage Skulls doing some phenomenal releases. Sales though have fallen through the floor in the last 18 months. Obviously it's great for the 'scene' that labels like U&A exist, pumping money into releases, discovering artists and giving them a platform to thrive on, as well as getting some great professionally mastered music out to the masses, but I've never been one to chase sales, and with diminishing returns it's got to the point where you're barely covering costs ... so I've decided to take a break from it for a while to focus on other projects that are exciting me like my new label StereoPhoenix and The One Series parties. >> So tell me about your new nights called The One Series and where did you come up with the concept? The concept is simple. One DJ, One Room, All Night. We are putting on events that we're trying to make exceptional - giving people an amazing experience that's out of the ordinary of what we've become conditioned to expect from McMusic 2012 style. It's a reaction again generic music, against short, overly loud sets, against the predictability of a 1-hour set of Beatport charted music that everyone is playing. It's also an opportunity to really spread your wings as a DJ - to take a night and a crowd on a huge journey - to write a book, rather than a fragmented chapter. >> I've listened to some of your sets of late, do you hate being pigeonholed genre wise? You seem to play almost everything under the sun from Minimal to Tech House to Techno to tech funk? I believe some people would regard you as breaks. Haha. The only time I'd ever play a breaks set as such would be in Southern Spain or in Russia where the fanbase is quite militant about their expectations. Listen to a set from 2000 / 2001 and it's just as varied :) Look at someone like Laurent Garnier - people wouldn't describe him as techno per se, they just see him as Laurent Garnier, a standalone artist - the key is being open-minded and having some range to what you do. I don't think many people who see me play at Burning Man for example would describe me as anything other than a 'DJ' as opposed to anything genre-specific. I think people will see that range come to the fore in the new material I'm doing as Simon Shackleton coming out on Stereophoenix next year. I'm SO proud of that stuff and haven't been happier in the studio for years! >> How do you find time for your family? You must be very busy with your label, your deejaying and everything else you wish to do? I find ways of prioritising them. Nothing's more important than family. 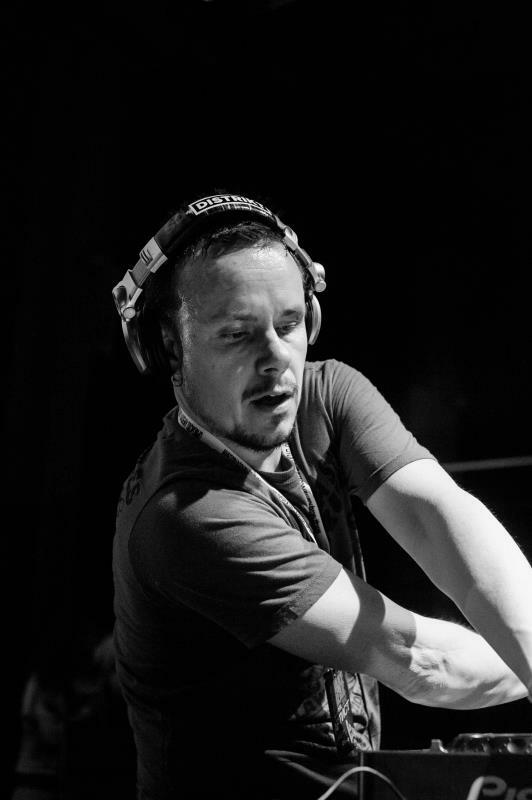 >> You mentioned you were a big fan of Max Cooper, Maceo Plex among others, do you find that the young deejays are impressing more and more with the quality of their sets and music? No, quite the opposite most of the time. I just dig what those guys make, and what they play. >> So what is your setup when you deejay? I use Serato using the CD controllers on CDJ-2000s (allows me to use the USB sticks if I fancy it too) and have a set of Novation Dicers on the laptop which give me a bit more control over the structure of tracks. >> Has the computer taken over the work for the deejay or is it still a person who has to sequence the tracks? Sequencing tracks makes it sound like a boring science project, and to be honest I hear way too much of that in people's overly pre-planned and structured sets. DJaying is a human communication - you are taking music and telling a story that should add up to a lot more than the sum of it's parts ... anything less than that and it's not DJaying, it's selecting in my book. The One Series is all about rekindling that passion, showing people that there can be some real emotional weight to going through a whole night with someone. It's spectacular, and the sense of 'Oneness' that you get at the end of the night just cannot be under-stated! great interview, interesting to read, quality questions asked, no bs, and quality answers, also no bs, very good from the soul. loved it!! I have Seen Elite Force as many times of Krafty Kuts. Love the read Andy, top work on bringing this here and a big thank you Simon to take time out. Does Gower need a mention in the thank you list? And it's nice to see he put some effort into the answers as well. Becoming a deejay is to feel. What he meant was totally connected to your feelings which you tell it in a story-telling way through electronic.